Home » Spoilt or Spoiled – What’s the Difference? Differences between American and British English take several forms, including spelling. In most cases, these spelling differences don’t have an effect on the meanings of either word, and readers can still understand the author. Such is the case with our two words today. Spoilt is chiefly a British spelling, but, as we’ll find out below, even British writers use it at a much lesser rate than spoiled. What is the Difference Between Spoilt and Spoiled? In this post, I will compare spoilt vs. spoiled. I will use each word in at least one example sentence, so you can see how it should appear in context. Plus, I will show you a helpful memory tool that will make choosing either spoilt or spoiled easier in your own writing. What does spoiled mean? Spoiled is the traditional simple past tense conjugation of the verb spoil, which has multiple meanings. Spoil can refer to food that has gone bad and is similar to turned or rotted in these contexts. It can also mean to ruin something, like revealing the ending to a popular movie. In some context, a spoiled child is one whose parents have pampered him so that he feels a false sense of entitlement. Spoiled can also be the past participle of this verb. Past participles can also function as adjectives in sentences, like in the phrase don’t drink the spoiled milk. Don’t eat uncooked beef that has turned grey; it has probably spoiled and will make you sick. Spoiled milk will often smell and taste sour, and may become lumpy after a long enough time. Spoiled rotten or Spoilt rotten? The common phrase spoiled rotten refers figuratively to a child or young adult who has been pampered by his or her parents to the point that he or she feels a false sense of entitlement. Sometimes, such a child is called spoiled child. What does spoilt mean? Spoilt is an alternative spelling of the same word. It rarely appears in formal American writing, though it is somewhat common in informal spoken English. The British appear to be relatively keener on spoilt than are Americans. Even in British English, however, the spelling spoiled predominates. The above charts graph spoiled vs. spoilt in English books since the year 1800. As you can see, both language communities prefer spoiled in all senses, but British writers are more likely to use spoilt than their American counterparts. For your writing, the best practice is to use spoiled in all contexts. 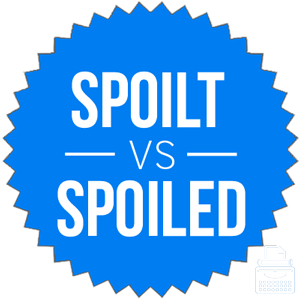 Spoiled is the traditional past tense inflection of this verb, and both British and American writers prefer this spelling. Since spoiled attaches the suffix –ed to the end of a past tense form, like other regular English verbs, simply remember the regular rules of English conjugation when you need to use this verb. Is it spoiled or spoilt? Spoiled and spoilt are two spellings of the past tense conjugation of spoil, which means to rot or to ruin something. Spoiled is the preferred spelling in all language communities. 1 What is the Difference Between Spoilt and Spoiled?